No parent can go without sleep for long. Repeated wakeful nights, listening for sounds of distress or being awakened by an infant's cries quickly take their toll on a parent's health and patience. This is an unhealthy situation for both parent and child. 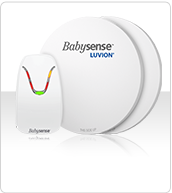 How does the Babysense work? Two round sensor pads are placed under the mattress in the baby crib and connected to the controle unit. Those extremely sensitive pads react on movement throught the mattress. When no breating movements are detected for more then 20 seconds an alarm will ring. Parents are directly warned when the baby's respitory conditions chang. This set contains 2 sensor pads and a control unit: complete for direct use.